Traffic backed up on Interstate 75 in Jennings, Fla., near the Florida/Georgia state line as people fled Hurricane Irma on Sept. 8, 2017. With the beginning of the Atlantic hurricane season, residents in coastal areas throughout the Southeast are once again being urged to have a plan ready in case they have to evacuate. After last year, it's a message that carries some weight. In the days before Hurricane Irma struck Florida last September, nearly 7 million residents left their homes to seek shelter and safety elsewhere. Since then, emergency managers and researchers have been studying the lessons of the largest hurricane evacuation in U.S. history. Hurricane Irma hit the Florida Keys as a Category 4 storm and then took a track up the entire Florida Peninsula. The storm's shifting track — first projected up the East Coast, then later forecast to pummel Florida's Gulf Coast — left most of the state's 21 million people in its path. 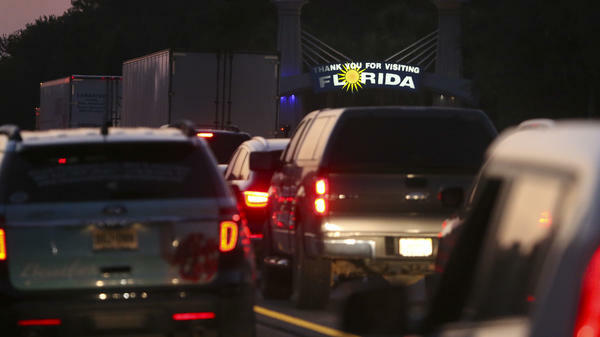 Heavy traffic clogged major Florida highways as millions evacuated. Mandatory evacuations were ordered first in the Florida Keys. As the storm approached, emergency managers in nearly every coastal county followed. Richard Olson, director of the International Hurricane Research Center at Florida International University, says that as mass evacuations go, it was successful. "Pretty much everybody who wanted to get out, got out," he says. "Although I've heard anywhere from 20 to 30 hours not being uncommon at all." Lines were long, but gas remained available for those heading north. It wasn't the nightmare scenario Texans experienced in 2005 as millions fled the advance of Hurricane Rita. Thousands in Texas were stranded in a 100-mile traffic jam after they ran out of gas. Twenty-four people died in a bus fire. In that case, as with Irma, the damage ultimately done by the hurricane didn't justify the massive evacuation beforehand. Bill Johnson, the director of emergency management in Palm Beach County, says nearly half of those who fled their homes for Hurricane Irma were from areas where evacuations had not been ordered. "We have an over-evacuation problem," he says. Emergency managers mostly order hurricane evacuations for water, not wind. In Florida, the biggest concern is storm surge. Disaster experts say rapidly rising water poses a much greater threat to property and lives than high winds. But with Hurricane Irma, researcher Jason Senkbeil says many evacuees held a different view. "The Irma evacuees," he says, "were terrified of wind." Days before it approached Florida, while it was still in the Caribbean, news reports focused on Irma's intensity and high wind speeds. Senkbeil, a meteorologist at the University of Alabama, studies how emergency managers communicate risk in hurricanes. During the Irma evacuation, he interviewed people at rest stops on Florida's interstates. Many said that when they made the decision to evacuate, Irma was still a Category 4 or 5 hurricane. "There was an idea there that at least 145-mile-per-hour winds were going to come across Florida," Senkbeil says. "And that's clearly not what happened." By the time it hit the Florida mainland, Irma was downgraded to a Category 3 storm and quickly lost intensity, bringing tropical storm force winds to much of the state. Clearly, it could have been worse. But Bill Johnson worries that unclear messaging led people in safe areas to evacuate their homes. Evacuations carry their own danger of traffic accidents and health problems related to increased stress. Also, they're costly. On average, Johnson says, evacuating costs $1,000 for a typical family. And unnecessary evacuations tie up scarce resources. "You saw the lines at the [gas stations]," he says. "You saw hotel rooms, many hotel rooms. People had to just keep going farther up the road because hotel rooms were taken." The National Hurricane Center is introducing new ways to show when and where strong winds will arrive for specific areas within a forecast cone. Johnson says those tools will help emergency managers encourage those who need to evacuate to do so early and to tell those who don't need to evacuate that their best course is to stay put and shelter in place. It's hurricane season in the Atlantic. And people who live along coastal areas throughout the southeastern U.S. are once again being urged to have a plan ready in case they have to evacuate. After last year, it's a message that carries some new weight. In the days before Hurricane Irma struck Florida, nearly 7 million residents left their homes, seeking safety elsewhere. NPR's Greg Allen reports that officials and researchers have been studying the lessons of the largest hurricane evacuation in U.S. history. GREG ALLEN, BYLINE: As hurricanes go, Irma was unusual, taking a path up the entire Florida peninsula. The storm, shifting track, first projected up the East Coast then later forecast to pummel Florida's Gulf Coast, left most of the state's 21 million people in its path. UNIDENTIFIED PERSON: We're just trying to get out of harm's way, get ahead of the storm. UNIDENTIFIED REPORTER #1: ...As more than a million Floridians are asked to evacuate. ALLEN: Mandatory evacuations were ordered first in the Florida Keys. As the storm approached, emergency managers in nearly every coastal county followed. Richard Olson, director of the International Hurricane Research Center at Florida International University, says as mass evacuations go, it was successful. RICHARD OLSON: Pretty much everybody who wanted to get out got out, although I've heard anywhere from 20 to 30 hours not being uncommon at all. ALLEN: Lines were long, but gas remained available for those heading north. It wasn't the nightmare scenario Texans experienced in 2005 as millions fled the advance of Hurricane Rita. Thousands were stranded in a 100-mile long traffic jam after they ran out of gas. Twenty-four people died in a bus fire. In that case, as in Irma, the damage ultimately done by the hurricane didn't justify the massive evacuation beforehand. The director of emergency management in Palm Beach County, Bill Johnson, says last year in Hurricane Irma, nearly half of those who fled their homes were from areas where evacuations had not been ordered. BILL JOHNSON: So we have an over-evacuation problem. ALLEN: Emergency managers mostly order hurricane evacuations for water, not wind. In Florida, the biggest concern is storm surge. Disaster experts say rapidly rising water poses a much greater threat to property and lives than high winds. But in Hurricane Irma, researcher Jason Senkbeil says many evacuees held a different view. JASON SENKBEIL: The Irma evacuees were terrified of wind. ALLEN: Days before it approached Florida, while it was still in the Caribbean, news reports focused on Irma's intensity and high wind speeds. UNIDENTIFIED REPORTER #2: Today, Irma, at 155 mph, is among the strongest hurricanes ever recorded. ALLEN: Senkbeil, a meteorologist at the University of Alabama, studies how emergency managers communicate risk in hurricanes. During the Irma evacuation, he interviewed people at rest stops on Florida's interstates. Many said when they made the decision to evacuate, Irma was a Category 4 or 5 hurricane. SENKBEIL: There was an idea there that at least 145-mile-per-hour winds were going to come across Florida, and that's clearly not what happened. ALLEN: Irma hit the Florida mainland as a Category 3 storm but quickly lost intensity, bringing tropical storm force winds to much of the state. Clearly, it could've been worse. But Palm Beach County emergency manager Bill Johnson worries that unclear messaging led people in safe areas to evacuate their homes. Evacuations carry their own danger of traffic accidents and health problems related to increased stress. They're costly - on average, Johnson says, $1,000 for a typical family. And unnecessary evacuations tie up scarce resources. JOHNSON: You saw the lines at the fuel. You saw, you know, hotel rooms - many hotel rooms, that people had to just keep going further up the road because hotels' rooms are taken. ALLEN: The National Hurricane Center is introducing new ways to show when and where strong winds will arrive for specific areas within a forecast cone. Johnson says those tools will help emergency managers encourage those who need to evacuate to do so early and to tell those who don't need to evacuate that their best course is to stay put and shelter in place.